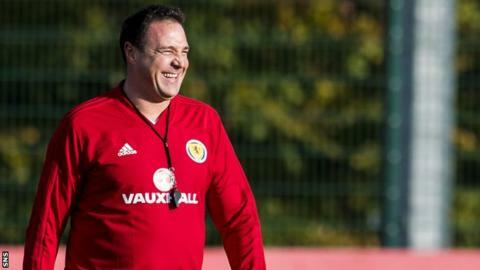 Malky Mackay is not in the running to become Scotland manager on a full-time basis, Scottish FA chief executive Stewart Regan has confirmed. Mackay is in interim charge of the national side for the friendly against Netherlands on Thursday at Pittodrie. But when asked if Mackay, the SFA's performance director, is in contention for the job, Regan told Talksport: "No, Malky and I have discussed this. "He's got a big job on his hands, he's said that himself." And Regan added: "He's been asked by the board to undertake this on a one-match basis, that's been made very clear and he knows that going back into the performance director job that Project Brave, the implementation of that and the management of seven squads, including the youth teams, are his domain. "Malky's got a big job to do and he'll go back to performance director after tonight." Mackay was put in charge on an interim basis after Gordon Strachan was sacked last month. Regan says there is no rush to find a replacement for Strachan, who departed despite being unbeaten in 2017 after Scotland finished third in their World Cup qualifying group. "It's early days," Regan added. "We have a small committee of the board who have been put together. I'm leading that group and we've had a couple of discussions already - one formal meeting and one conference call. "We've got a long list that's been prepared and it's very encouraging. We've got a lot of interest from home and from overseas, and I'm not surprised. It's a fantastic opportunity to come and lead a national team, particularly with Euro 2020 just around the corner. "We've been very encouraged and we'll take our time to get that long list considered, try to reduce it to a shortlist early in the new year, and hopefully make an appointment as soon as we can. "For me it's about getting the right person for this job. This is a big tournament for us, we know we need to make every effort possible to get to the finals of Euro 2020. "We need the right man at the helm and therefore we will take our time and try to make sure we get the right person appointed."